Stay tuned for the latest developments as Macedonia holds its all-important referendum on its historic 'name' agreement with Greece which will finally unblock the country’s EU and NATO paths. 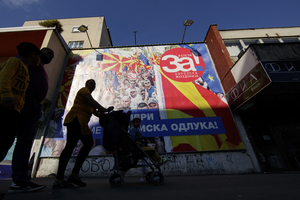 Today, Macedonians head to the polls to vote in an historic referendum to decide whether to support the 'name' agreement reached with Greece this summer that could unblock Macedonia's EU and NATO membership paths. A total of 1.8 million people are registered to vote, with a 50 per cent turnout needed for the vote to be legally valid. Under the deal, which would end a 27-year-long dispute between the two countries, Macedonia would be required to change its name to the Republic of North Macedonia. According to experts, this is a once-in-a-lifetime opportunity for the country to resolve the long-standing dispute with its neighbour, and if the referendum fails, the country can bid farewell to any immediate hopes of joining the EU and NATO. 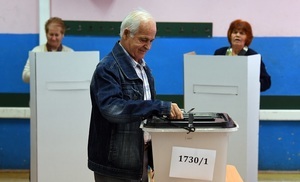 Turnout is key in today's referendum in Macedonia. For it to be legally valid, 50 per cent of registered voters have to take part. This means that 903,000 of a total 1,806,000 eligible voters need to cast a ballot. 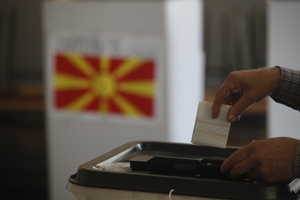 If the turnout is high and the 'yes' vote wins, Macedonian MPs will have the green light to pass the constitutional changes needed for the country to adopt a new name: The Republic of North Macedonia. But if less than half of registered voters take part, the ruling party will struggle to salvage the name deal. If the outcome is 'no', the ‘name’ agreement with Greece will fall apart. Voting began at 7am this morning, with a total of 3,480 polling stations open across the country at which some 1.8 million voters will have the right to decide whether or not they support the "name" agreement reached this summer with Greece. By 11am, the turnout was above 8 per cent, the State Election Commission, DIK, announced. Since voting opened at 7am, DIK has received seven complaints about the electoral process, of which three were rejected, Tanjug news agency reported. 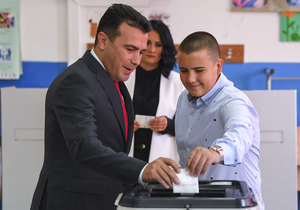 Macedonian Prime Minister Zoran Zaev cast his ballot in the today’s ‘name’ referendum this morning, with his family by his side, and appealed for all eligible citizens to also go and vote. “I urge everyone to come out and make a serious decision for the future of our country, for the future generations,” Zaev said, Tanjug news agency reported. Four minor incidents have been registered so far in today’s ‘name’ referendum, Macedonian Interior Ministry spokesman Toni Angelovski announced, according to reports from Tanjug news agency. 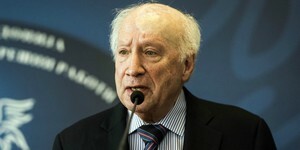 For over a quarter of a century, UN envoy Matthew Nimetz has been mediating the dispute between Macedonia and Greece over the former’s name. In that time, he has seen over a dozen prime ministers come and go in Skopje and Athens, while the bilateral row stayed the same. In the lead up to today’s make-or-break referendum on the ‘name’ deal reached between the two countries, Nimetz sat down with us to talk about his role in the negotiations – and the huge risks at stake if the agreement is not approved. During the diaspora voting on Saturday in Australia, citizens reported being filmed and called “traitors” by proponents of the referendum boycott at the entrance to the polling station in the Macedonian consulate in Melbourne. A Facebook profile called "Traitors", where these videos and photos were posted, has since been removed. 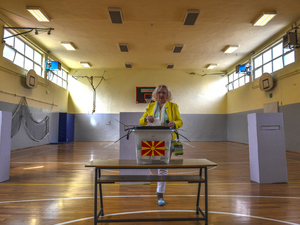 “Any photographing and filming of voters during voting, as well as publishing photos of voters, represents a violation of the right to vote and is forbidden by law,” Macedonia’s Public Prosecution said in a statement after news of the incidents surfaced. It added that this, and any similar instances that arise, will be a matter of priority for the prosecution. The vice president of the main opposition VMRO DPMNE party, Aleksandar Nikolovski told media that he will not vote at the referendum. “Voting whether Macedonia should be renamed or not, for me, represents humiliation, [and] stepping over my dignity”, Nikolovski told media. As a ‘name’ deal between Macedonia and Greece has drawn closer, some of the loudest voices against a deal were heard among the diaspora of both countries. 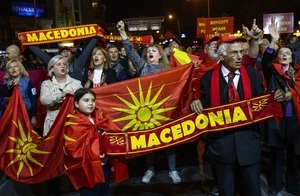 Macedonian emigres as far afield as Australia and the US, as well as across Europe, took to the streets over the past few months to voice their denouncement of a deal that would involve changing Macedonia’s name. In the lead up to today’s referendum, Sinisa Jakov Marusic took a look at how the diaspora see the situation. 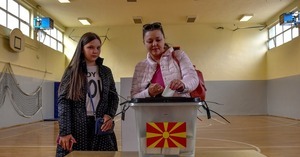 After casting his ballot in the ‘name’ referendum, Macedonia’s Minister of Foreign Affairs, Nikola Dimitrov, said he hopes that Macedonia will "finally move forward and in the right direction - towards the EU and NATO, while preserving everything that is important." "This is a great day for Macedonia and a great day for friendship with Bulgaria, Greece and our other neighbours. I am convinced of this, and it is also exciting because today is my birthday," Dimitrov told reporters, Beta news agency reported. By 1pm, the turnout was 16 per cent, the State Election Commission, DIK, announced. The voting process thus far is normal, with minor incidents and flaws being registered, which are being addressed on time by the DIK and other institutions, the Electoral Commission said. 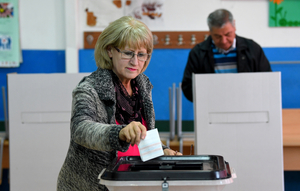 In comparison, the last local elections, held in 2017, had a turnout of 27 per cent by 1pm, said the head of the State Electoral Commission, DIK, Oliver Derkovski. “These are two different voting cycles and it is normal that the turnout at elections to be higher,” Derkovski added. 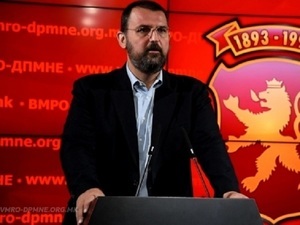 The leader of the main opposition right-wing VMRO DPMNE party, Hristijan Mickoski has decided not to vote at the referendum, the party spokesperson Naum Stoilkovski told media. Stoilkovski said that “Mickoski is against a name change and against a deal that will humiliate Macedonia”. During the referendum campaign, some accused the party of playing a 'two-faced' referendum game, on one hand appeasing the international factors who demand that it participate on the plebiscite, while at the same time discretely pushing for a boycott behind the scene. 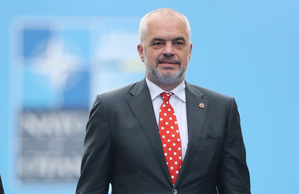 Albanian PM Edi Rama expressed via Twitter today his hopes that every Albanian in Macedonia understands the weight of responsibility of the ‘name’ referendum and its effect on future generations, no matter political convictions or party background. “Today in Macedonia there is a vote for the children and who does not vote threatens their future!” he said on his official Twitter account. By 3pm, the turnout was 22.56 per cent, the State Election Commission, DIK, said. 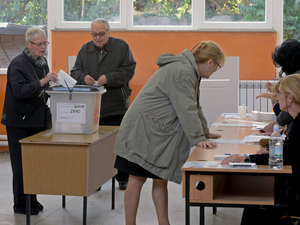 Skopje's municipalities of Centar and Karposh have the highest turnout thus far. According to the head of the DIK, Oliver Derkovski, the voting has been taking place in a democratic atmosphere. 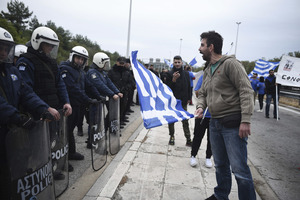 As Macedonians vote on the ‘name’ deal reached with Greece this summer, Greek protesters staged a small rally near the Evzonoi border crossing with Macedonia, voicing their opposition to the agreement. Macedonia’s name has been at the centre of a dispute with Greece for 27 years, since the former Yugoslav republic gained independence. Macedonia is already the name of a region in northern Greece, and Athens has long argued that its neighbour’s name implies a territorial claim on its own northern province. The opposition VMRO DPMNE party has accused the ruling Social Democrats of pressuring people to vote in today’s election. At a press conference held this afternoon, the opposition party aired an audio recording between two persons, whose voices have been slightly distorted, in which a female person presenting herself as phoning from the Social Democrats HQ, reminded an alleged citizen that he should go out and vote, to which he replied negatively. While VMRO DPMNE spokesperson Naum Stoilkovski insisted that this was evidence of pressure on voters, the validity of the phone call has not been proven and the Democrats are yet to respond. The alleged phone recording was published on YouTube. 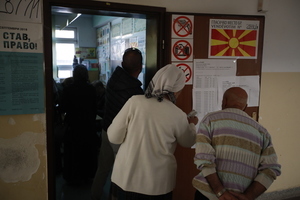 Macedonian Interior Ministry reported that during the voting they have registered several smaller incidents, mostly involving unauthorized photographing of voters near the polling stations and directing insults at them. Such instances have been registered in the capital Skopje, the towns of Tetovo and Strumica and in the rural municipality of Brvenica. By 5pm, the turnout was 28.83 per cent, the State Election Commission, DIK, announced. This figure was based on 87.20 per cent of processed data from all polling station, said the head of the DIK, Oliver Derkovski. In a press release, Macedonia’s main ruling Social Democrats called earlier allegations from opposition VMRO DPMNE that they had pressured people to vote “fake news”. “VMRO DPMNE is nervous because despite the boycott plotted by the opposition leadership, MPs and members of VMRO DPMNE are voting,” the Social Democrats said. Until now, several prominent VMRO DPMNE figures and several of their MPs have come out and voted in the referendum. More online bots have been talking about Macedonia and its historic ‘name’ referendum in the lead up to today’s vote than were active during the recent elections in Mexico and Italy – despite these countries far outweighing the population of Macedonia, according to an analysis by the Transatlantic Commission on Election Integrity shows, Newsweek reported. 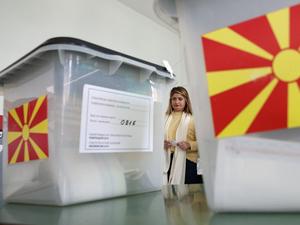 The polls in Macedonia's all-important 'name' referendum have now officially closed. By 6:30pm, the turnout was 34.09 per cent, the State Election Commission, DIK, announced. This figure was based on 84.83 per cent of processed data from all polling stations, the head of the DIK, Oliver Derkovski, said. For the vote to be legally valid, turnout had to exceed 50 per cent. 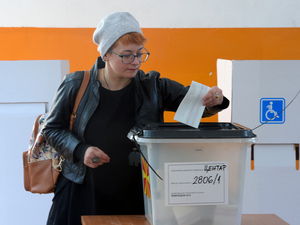 The Macedonian Interior Ministry announced that 19 minor incidents were registered during today's referendum, Tanjug news agency reported. 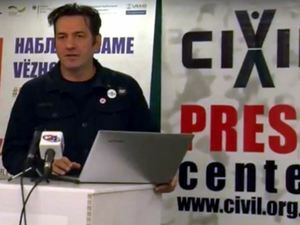 The election observers from Civil-Center for Freedom, an NGO, said that the referendum went without serious incidents but with many smaller irregularities. “This day will stay remembered by the massive breaking of the per-referendum silence and hindering of voters to express their will at the referendum”, the head of Civil, Xhabir Deralla told a press conference. 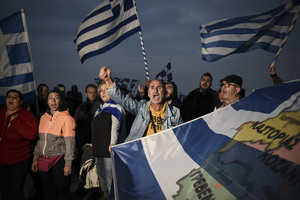 As Macedonians cast their votes in the referendum on their country's name deal with Athens, Greek protesters held a rally in the northern city of Thessaloniki against the agreement reached with neighbouring Macedonia this summer. The deal is aimed at ending a 27-year-long ‘name’ dispute with Greece that centres on the country’s insistence that use of the word Macedonia implies a territorial claim to northern Greek province of the same name. Macedonian Prime Minister Zoran Zaev, in a public address after the polls closed, called the referendum democratic and free. “Today we had a success for European Macedonia. 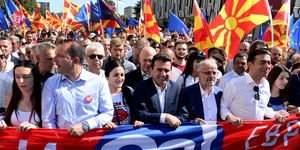 Regardless of the boycott organised by the [main opposition] VMRO DPMNE leadership, with some exceptions, I expect that the majority [of voters] have voted ‘Yes’ [for the name agreement],” Zaev said. He added that if this is indeed the case, the opposition should respect the will of the majority that voted and support the constitutional changes needed in parliament for adoption of the new name - Republic of North Macedonia. “If not, there is no alternative. We will need do use the other democratic tool at our disposal and that means early general elections immediately! 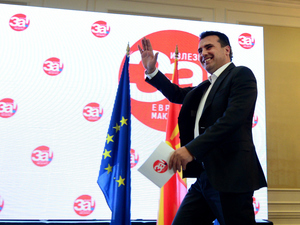 Macedonia will become an EU and NATO member!” Zaev said. Just minutes after Prime Minister Zoran Zaev addressed the public, Parliament Speaker Talat Xhaferi took to the microphone to congratulate citizens on the referendum and their democratic voting. “What is most important is that the citizens showed that they belong to the big European family. They have laid the foundations for the future Macedonia. This day will be a basis for the future procedures in Parliament,” Xhaferi said. Opponents of the 'name' deal with Greece are celebrating the low turnout in today's referendum in front of the parliament building in the Macedonian capital of Skopje. According to the latest figures from the Central Election Commission, voter turnout was just below 35 per cent. For the referendum to be legally valid, more than 50 per cent of eligible voters had to take part. 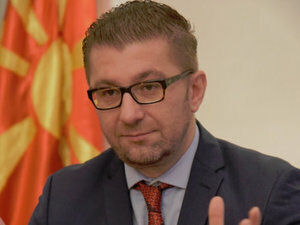 In a public address, opposition VMRO DPMNE leader Hristijan Mickoski said that the strongest message in the referendum was sent by those who boycotted or voted against the ‘name’ agreement with Greece. Mickoski added: “The people are strong, they were not broken by the brutal threats…,” accusing the government of futile attempts to rig the referendum. 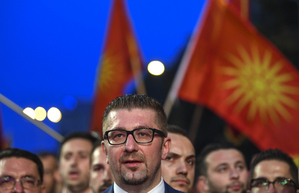 He also directed a message to the government, stating “VMRO DPMNE stays with the people and we will beat you,” claiming that today is a defeat for the government. The citizens at the referendum have sent a message that the legislators in parliament should decide about the future of Macedonia, the ethnic Albanian BESA party, which formed part of the “Yes” camp said after the polls closed. 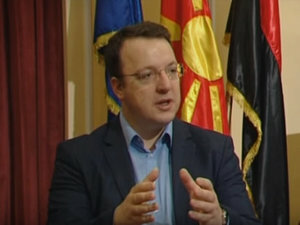 “BESA is prepared for the next phase which is ahead of us, [meaning] the constitutional changes where we will give our suggestions and views in order to make the needed corrections so that we have constitution that will guarantee full equality of Albanians in Macedonia and building a sure European future in NATO and EU”, BESA president Bilal Kasami told a press conference. 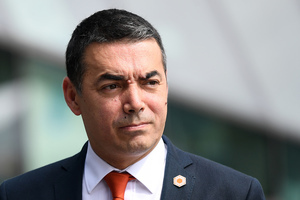 Ali Ahmeti, the head of Macedonia’s junior ruling and ethnic Albanian party, the Democratic Union for Integration, DUI, said after voting closed today that Macedonia can't waste time by holding early elections and that it has better things to do. “Today we are saying that the parliament should reach the decision regarding this process, and we will vote for that decision. At the 2016 [early general] elections we, all political parties, stated that we are for NATO and the EU because there is no other alternative,” Ahmeti said. His statement comes after Macedonia’s Prime Minister Zoran Zaev said in his press conference earlier tonight that is the opposition does not respect the will of the majority who voted, early general elections may be called. 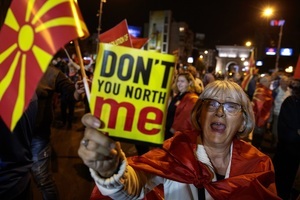 Around 1,000 opponents of Macedonia's 'name' deal with Greece are celebrating in Skopje tonight after today's referendum failed to reach the 50 per cent threshold of voter turnout required to make it legally valid. 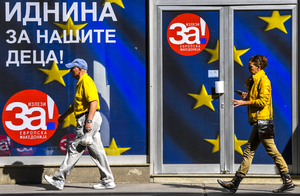 Around 35 per cent of eligible voters cast their ballot in the vote, which was seen as crucial to overcoming the long-standing Greek blockade on its path to EU and NATO membership. In his second public address of the night, Prime Minister Zoran Zaev claimed that no better deal can be reached with Greece than the one signed this summer, which requires the country to change its name to the Republic of North Macedonia. In the coming days, the 'yes' camp will attempt to achieve the support of the two thirds majority in parliament required to be able to pass the constitutional changes to adopt the new name. The governing majority, and opposition MPs already in favour of the deal, make up 71 out of 120 seats - nine short of the 80 needed. If this is not achieved, Zaev announced that early elections will be called. That concludes our coverage of today's 'name' referendum in Macedonia, in which both sides have claimed victory despite the low turnout. For a summary of events, read our wrap-up of the vote. We'll be covering developments in the following days as Prime Minister Zoran Zaev and his 'yes' camp try to win over support for the 'name' deal from oppositions MPs. Check in with us here this week to keep up to date on the latest events.